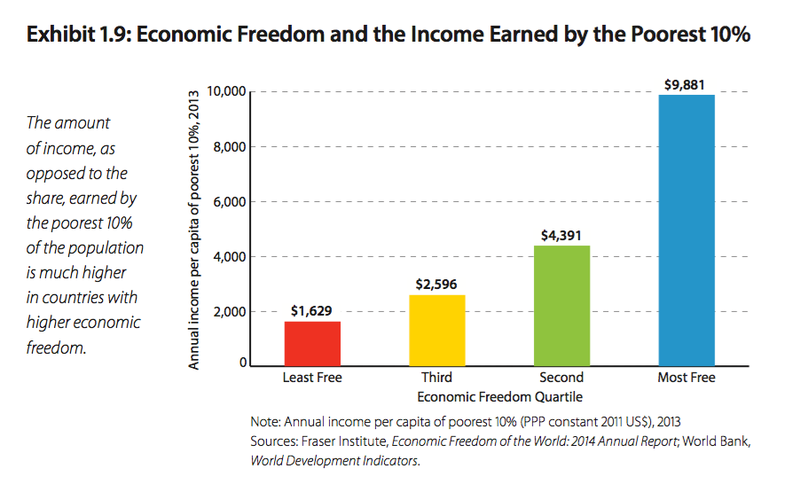 The freer a country is, in economic terms, the higher the income of the country’s poorest citizens. What do the data themselves look like? Here’s a graph I did for 2005 – I chose an earlier year because there isn’t data for every country for each year, so I wanted to be able to use data from an earlier or later year, whichever was closest. The measure of income is from the World Bank’s Development Indicators. 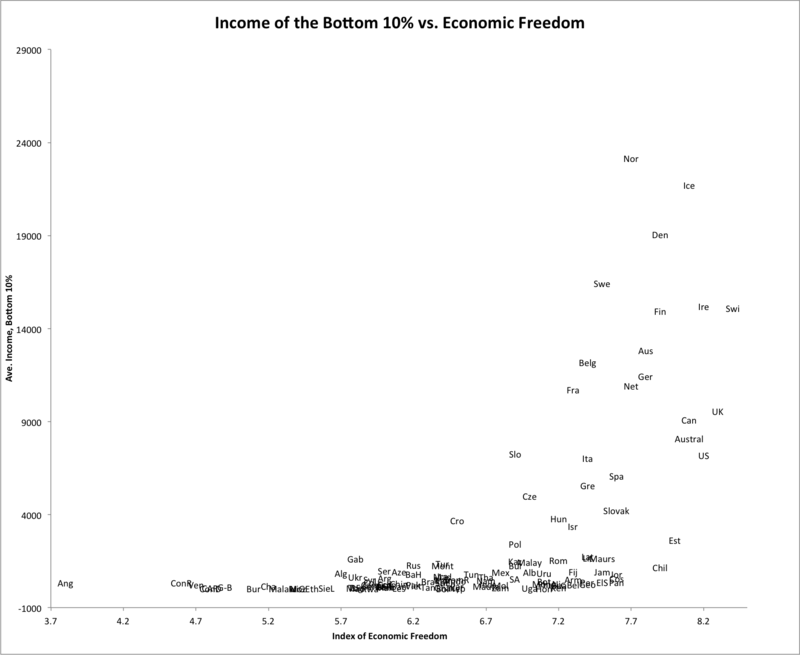 So there is an association – and if you’re prepared to consider a curve as opposed to a straight line, then past some mid-level of economic freedom the income of the bottom 10% takes off! By way of contrast, Canada scored an 8.08 on legal / property rights in 2005. Clearly I should have truncated a bit higher to get rid of troublesome Croatia and Slovenia, which are threatening to give a positive slope. To compensate, I’ve very subtly circled in GREEN Sweden et al, and in RED the anglo-saxon countries. 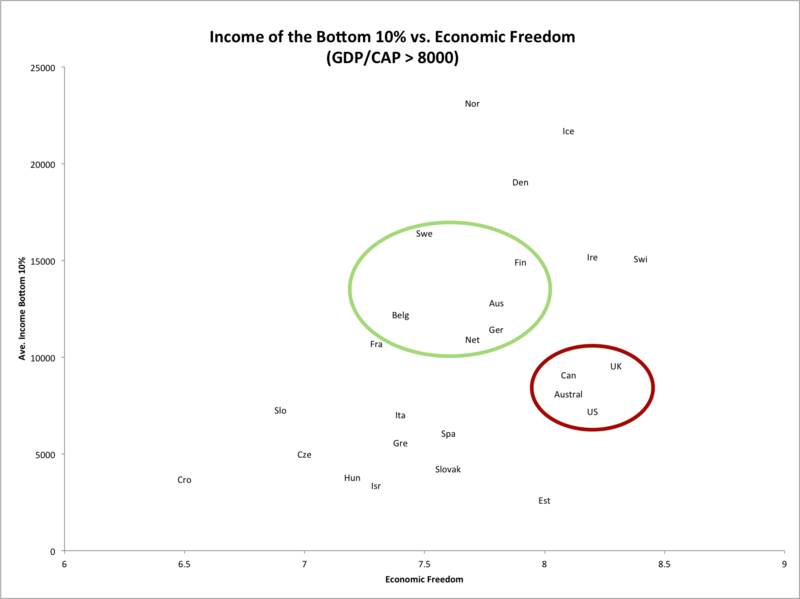 The point is that if one thinks that these countries are the ones that are truly comparable, it looks like more economic freedom is associated with the worst off doing worse, in absolute terms. (I think the main story here is that the countries in green, while being highly open to trade, have larger shares of their economies going through the hands of government. Will Wilkinson has recently suggested that it may be in part because citizens there are more protected from the ups and downs of the market economy that they are willing to tolerate such openness to foreign competition. If I’m not mistaken this is essentially Geoffrey Garrett’s thesis,in Partisan Politics in the Global Economy). There are lots of complexities here, in the data, and in the inferences we might want to make about causal mechanisms, but as this is the second post in one day, I will leave it at that.